15mm Chrome Heated Towel Rail Radiator Valves Taps. Traditional Victorian Chrome Heated Towel Rail Radiator. Heated Towel Rail Radiator - Straight Chrome Bathroom Rad Straight Angled Valves. 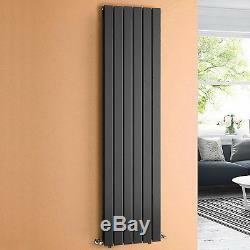 Anthracite Flat Panel Vertical Radiator Bathroom Central Heated Rad 1800 x 452mm. Get your new Anthracite Flat Panel Radiator tomorrow. Triple layered anthracite finish to ensure a high quality finish. Manufactured by ISO9001:2008 registered manufacturers and tested to BS EN 442 standards. All fixtures and fittings included. BTU: 5874 Pipe Centre: 1750mm Distance from wall: 17 - 83mm. Ireland, Isles of Man, Scilly (chargeable to the following postcodes: AB30-39, AB41-45, AB51-56, BT, DD, GY1-10, HS1-9, IM1-9, IM86-87, IM99, IV3, IV3-28, IV30-32, IV36, IV40-49, IV51-56, IV63, JE, KA27-28, KW1-17, KY, PA20-49, PA60-80, PH1-7, PH14, PH21-26, PH30-44, PH49-50, PO30-41, TR21-25, ZE1-3). All of our goods are sent out via insured courier, so when signing for your good please ensure they are not damaged. Giving You Fresh Designer Bathrooms. We strive for excellence in all areas of our products as well as taking pride in integrating stylish yet durable bathroom fittings into each range. We offer diverse ranges of bathroom products from a basin waste to a full bathroom suite. We source and design high quality products and by trading online we are able to pass those extensive savings onto you the customer. We have seen steady growth in sales and feedback since this point and will be around for many years to come. You can trust that we can deliver the product you order in the time you expect. Not only that, you can rest assured you will get the after care service you deserve from our highly trained customer care team. This will contain the details of the courier and your consignment number. Please do not schedule or start any installation work until after you have received your order and checked all goods for any defects or missing parts. This will enable us to resolve any technical questions or to order specific additional fittings if needed. When will my order arrive? Where on my property will you deliver to? Can you deliver to a different address? We are unable to change the address once ordered. Any large items sent via Woodalls will be taken back to their depot. All collections are Monday - Friday. At Fresh Bathrooms, you can pay for your items by. Fresh Bathroom Payments Attleborough House Townsend Drive Attleborough Fields Industrial Est Nuneaton CV11 6RU United Kingdom. Townsend Drive, Attleborough Fields Industrial Estate, Nuneaton, CV11 6RU. For guarantee reasons we need photos of the offending item and its fault. Once this information has been received we can assess the case and whether a part or replacement is needed. You must also have taken reasonable care to not mark or damage the product. Fresh Bathrooms Luxury For Less Limited Attleborough House, Townsend Drive, Attleborough Fields Industrial Estate, Nuneaton, Warwickshire CV11 6RU, United Kingdom 02476 389 051. The item "Anthracite Flat Panel Vertical Radiator Bathroom Central Heated Rad 1800 x 452mm" is in sale since Friday, January 13, 2017. This item is in the category "Home, Furniture & DIY\Heating, Cooling & Air\Radiators". The seller is "fresh_bathrooms" and is located in GB.